I recently consulted with the Scottsdale Museum of Contemporary Art, and provided some John Stanley material for an upcoming exhibit which will feature work by artist Jon Haddock. He names John Stanley as one of his influences, as well as other comics creators. 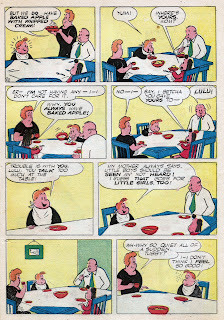 "The Kid Who Came To Dinner" was one of a few "Little Lulu" stories personally chosen by Mr. Haddock for the exhibition. 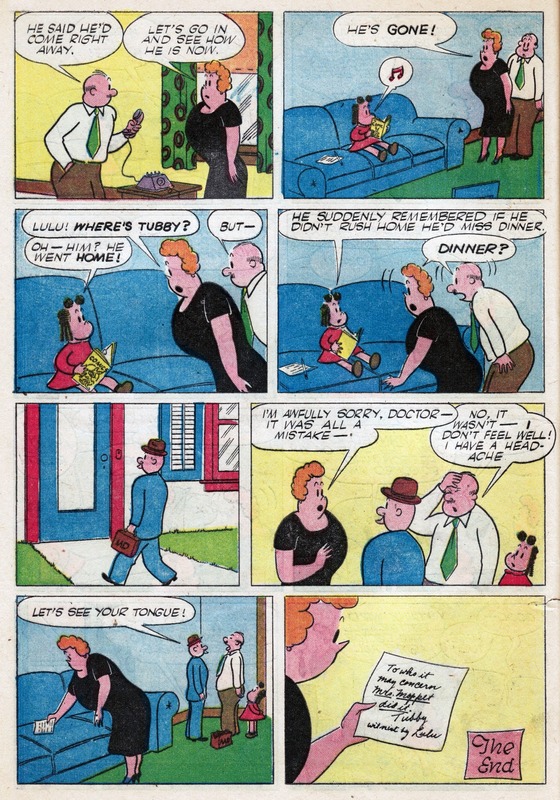 Doing these scans (along with "The Hooky Team," the third-longest "Lulu" story, also published in 1947) gave me a fresh look at these long-familiar stories. 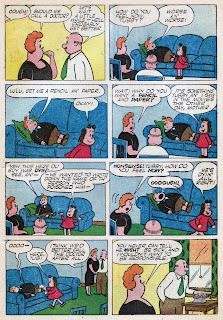 It reminds me how easy it is to take Stanley's Little Lulu for granted. In '47, Stanley's Lulu was still a work in progress. 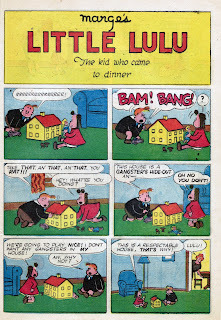 His take on the characters continued to evolve until the end of the 1940s. Their actions, reactions, motivations and frustrations remained essentially the same until later in the 1950s. At this time, Charles Hedinger and Irving Tripp did the bulk of the artwork for this series. It was a transitional period for the feature. The awkwardly designed characters wouldn't really look right 'til Irving Tripp took a more prominent role, circa 1950. Stanley's hand, from his pencil rough "script," emerges when the characters themselves are agitated. Flashes of his 1960s work can be glimpsed through the cracks. This story's title is an allusion to a popular play (made into a hit 1941 movie) by George S. Kaufman and Moss Hart, called The Man Who Came To Dinner. The play gave Monty Woolley the role of a lifetime as a-hole/art critic Sheridan Whiteside. 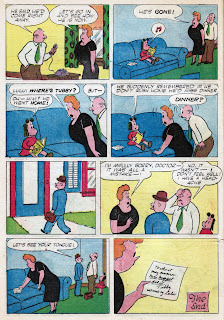 The story features an early version of Tubby Tompkins--the most essential John Stanley character. Stanley's Tubby was still a work in progress. 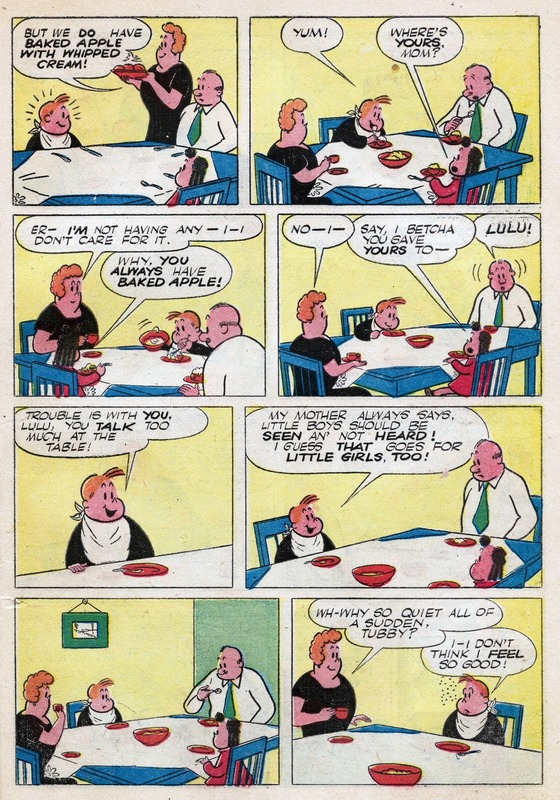 As with Lulu herself, Tub seems more a genuine kid in this 1947 piece. Here, he's more arrogant that Quixotic. The most important thread to the finalized Tubby is his unwavering sense of self-rightness. Like Larry David's persona on the TV program Curb Your Enthusiasm, Tubby makes aggressive, eagerly expressed statements that ripple the calm waters of mid-century American civility. Stanley sets this story at a familiar familial Ground Zero--the dinner table. Tubby's anti-social antics steal the show in "The Kid Who Came To Dinner." In this still-developing state, his brash, larger-than-life persona overpowers the intended calm of the Moppet household. Stanley had yet to refine his interpretation of the Lulu character. She is not the wise voice of reason we see in the 1950s stories. She still retains some of her spitfire quality from the Marge Buell gag cartoons. The Lulu of, say, 1952 would never be this mouthy or impulsive. It's clear that she resents Tubby's usurpation of the family dinner table routine. Lulu's parents do their best to maintain proper decorum, despite the series of challenges hurled at them by Tubby's presence and personality. 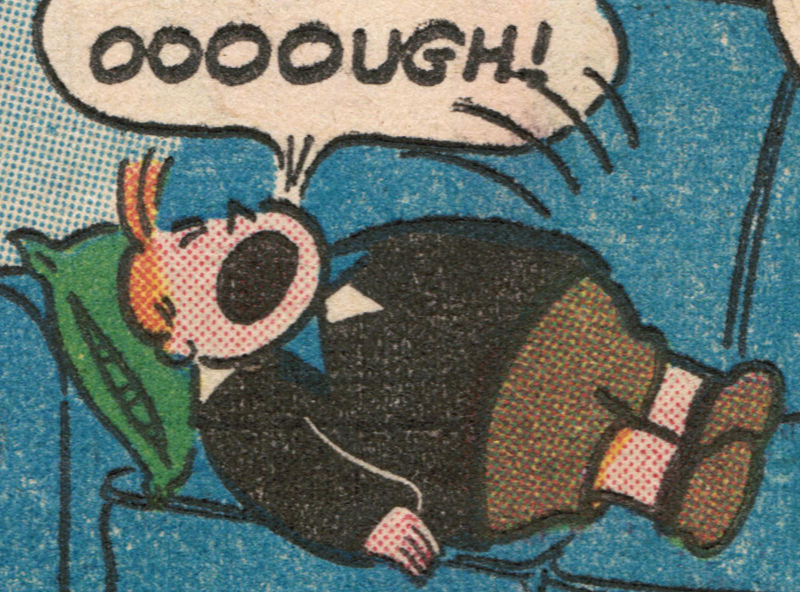 Lulu's father cracks under the stress. 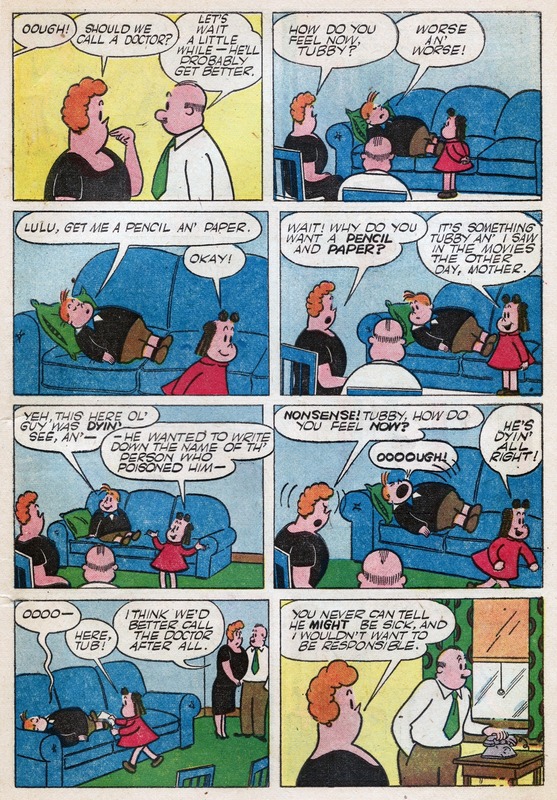 Her mother retains her cool, altho' it's clear to see her bewilderment at Tubby's presence. 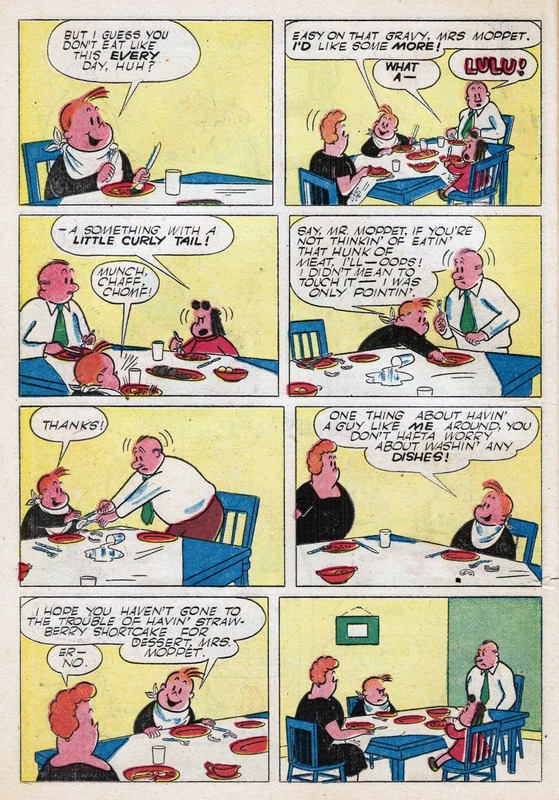 Tubby's love of food often leads him to physical discomfort. 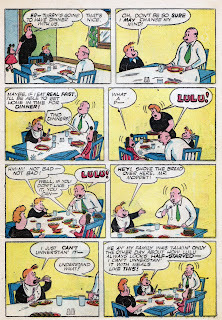 Here, as in Stanley's masterpiece-level "Great Day" (Little Lulu #23), Tub has a rapt audience for his theater of nausea. 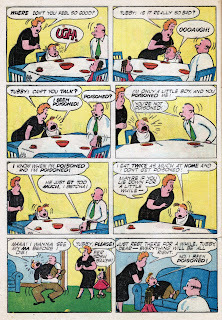 By the sign of one Stanleyism--spots before the eyes--we have evidence that Tubby is indeed queasy. He seizes this opportunity for higher status, and flaunts it for all it's worth. I'm impressed by the subtle layering of the last page--which ends on a note of quiet melancholy. Those last two panels are masterful. The doctor, meant for Tubby, begins to examine Lulu's harried father. As this happens in the background, we see Lulu's mother reach for the note Tubby scrawled. That final frame is amusing and sad-making, in equal measures. Lulu's mother has no expression on her face. In the wake of Tubby's anti-social visit, the note's vague, convincingly childlike accusation is a jarring coda. I would imagine Mrs. Moppet was subdued and glum for the rest of the evening. Although John Stanley's Little Lulu was still a work in progress, in 1947, his emergent sophistication as a writer, shaper of characters, and status-tician is strongly felt in "The Kid Who Came to Dinner." This story is a great choice for the walls of an art gallery. Thanks for sharing the comic and the insight! I wish I could make it out for the exhibit, it sounds great! If by 'work-in-progress' you're only referring to the characters' traits, than yes, I'd agree with you. I'm sure if it was done a bit later Mr. Moppet would have thrown Tubby out himself after pigging out, Tubby would go home to tell his parents how the Moppets starved him, and the story going off in a whole different direction. 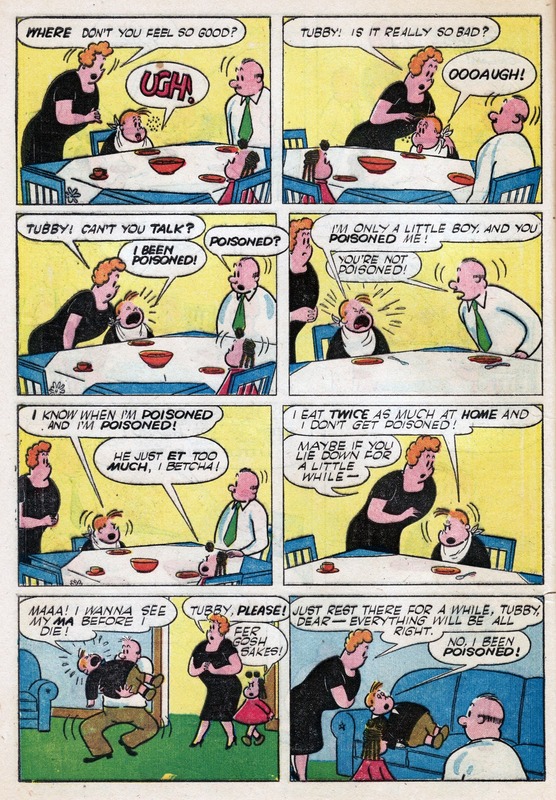 I would also like to nominate the final panel on page four as a small masterwork in itself. It really captures the scope of the whole situation nicely: an obese little kid's gluttony really doesn't amount to much of anything in the world and probably could be easily snuffed out if the adults in his life didn't enable it. 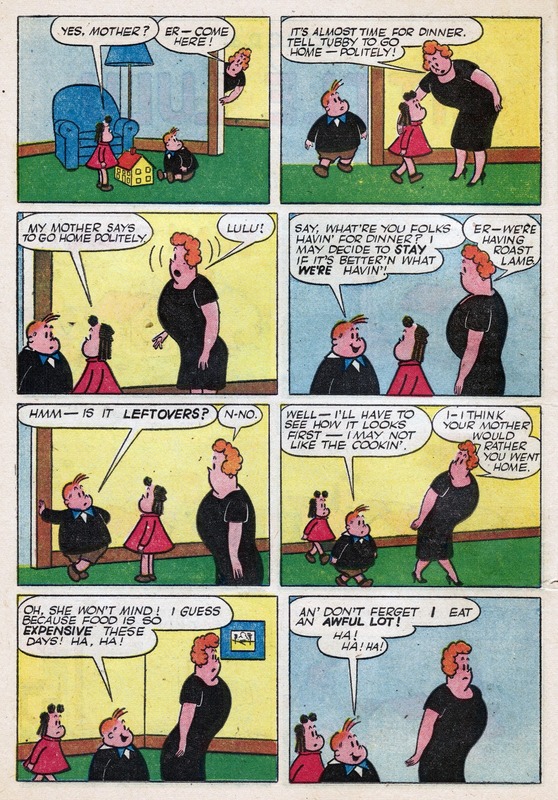 I'm a proponent of the 'less is more' theory and work like this really proves it, even if it goes against certain censorious cartoonists' dogma. 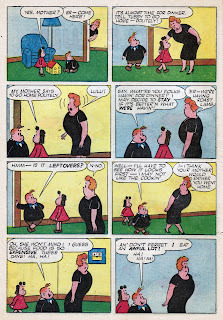 Yes, "The Gourmet" (Little Lulu #5) is a masterpiece. I've meant to post that piece, and write about it, since I began this blog. Thank you for the reminder of its greatness--and for your always-astute comments. And, yes again, it was character traits I alluded to with that 'work in progress' business. Good call, sir.